Looking for effective line queuing that won’t break your budget? LOOK NO FURTHER THAN OUR QUEUEWAY LINE BARRIERS! Queueway line barriers are great for indoor and low impact queue line management and crowd control! Queueway economy retractable belt stanchions are the cost effective way to keep your customers in line and maintain orderly traffic flow. Common uses include post offices and government buildings, retail stores, concession stands, and movie theaters. We offer these stanchions in three post options and four belt colors. 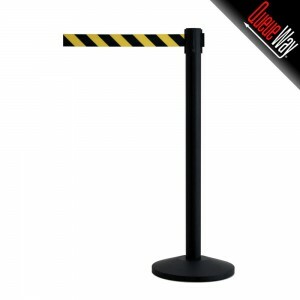 The black post stanchion is commonly used at retail outlets, concession stands, and restaurants. The polished stainless steel stanchion is great for museums and banks. Our most elegant Queueway stanchion is the satin chrome – great for government buildings.